a FREE Introductory Class. You must be a first time student. Get to know the school and experience for yourself the challenging and rewarding environment of Tae Kwon Do. Call (269) 327-7000 today for more information. !!! NOW TEACHING GongKwon YulSul !!!! 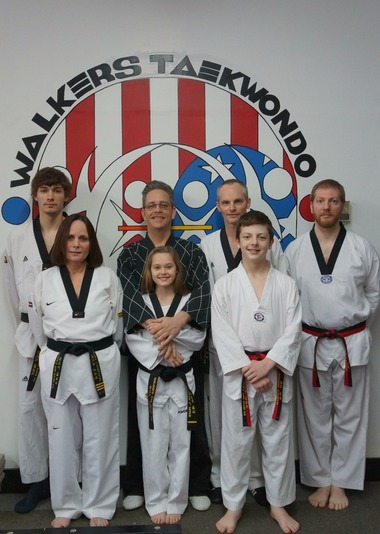 Walker’s Taekwondo opened in August 2000 and is owned and operated by Master Mike Kadrovach. Mike is a Kukkiwon certified 5th Dan black belt. He began studying Tae Kwon Do at the age of 25, and has been studying and practicing in the Portage area for over 25 years. Mike's passion for Tae Kwon Do is readily apparent to all of his students. Mike's goals for his students are: (1) to be better than himself and (2) to strengthen their spirits with the "I can" way of thinking. "I can't" at Walker's, are replaced by "I'll try." At Walker's, the Ji Do Kwon form of Tae Kwon Do is taught. Ji Do Kwon is one of the major Tae Kwon Do associations, which is sanctioned by the World Taekwondo Federation (WTF) at the Kukkiwon in South Korea. Tae Kwon Do has grown as a unique Korean self-defense art for about 20 centuries. Today, the popularity and enthusiasm for Tae Kwon Do are not only domestic but worldwide because of the dominant superiority of Tae Kwon Do over any other kind of self-defense art in the world. The history of Tae Kwon Do proves that it is far more than a self-defense method. Not only does it encourage positive moral values such as trust and courage, but Tae Kwon Do develops self confidence and respect.